When people think of steel they generally think of strong, bulky industrial structures that are ugly and exist only to serve a functional purpose. And while steel fencing is incredibly strong, it can also be designed and customised to achieve the exact look you want—a look that compliments your home perfectly. So if you’re after a secure, low maintenance fence that looks precisely the way you want it too, then steel is your best bet. Where other materials might fade or warp, steel fencing’s strength keeps the structure honest under extreme pressures. It can’t all be sitting back and admiring though. Like all materials, steel does get dirty. The difference between steel and other fencing materials is that all it takes to clean up a steel fence is a hose and… nothing else! Unlike other materials which gradually fade and lose their shine with each cleaning effort, a quick hose down will keep a steel fence coming up good as new for decades. No matter where you are in Australia, the weather is either unpredictable or harsh. Steel fences are specifically made to last against and stand up to the variety of destruction that the elements can cause. This drastically lessens the likelihood of ever having to put in a new fence or gate on your property, saving you time, money and worries. There aren’t many materials around that are more difficult to penetrate than steel. Having a strong looking steel fence around your house can act as a deterrent and prevention to any unwanted guests and elements. If keeping away from the prying eyes of the neighbours is important to you, then a high steel fence with no gaps is the go. It will completely enclose your property, turning your yard and visible indoor areas into a private, relaxing sanctuary. As a 100% recyclable material, steel is extremely environmentally friendly. It is also resistant to pests like termites, so spraying chemical treatments around your fence to stop it from falling down will be a thing of the past. This can ease your environmental conscience and stop you worrying about the dog, cat or kids coming across any chemicals unnecessarily. If your home is in an area that’s vulnerable to bushfires, then steel fencing is a safety necessity. Steel is far and away the most fireproof material for fencing. It’s not just that it won’t help fuel the fire like a wooden fence does; a steel fence can actually pro-actively serve as a barrier against fires around your home. With materials like wood, you might end up having to pay much more for expenses such as repainting and replacing worn or damaged parts of the fence. Steel fencing very rarely experiences any of these problems and in the long run it is a great economic choice. A strong steel fence can add some value to your property. The resilience and durability of a fence made from steel can easily catch the eye of both potential buyers and insurers. This can ramp up the value of your house, or lower those insurance premiums. If you do decide to opt for a fence constructed from steel, be prepared to make some decisions! If none of the popular ready-made designs are your thing, then you can take advantage of the option to have your own design fabricated and customised to your home. It can even include ornamental and decorative designs as a cherry on top of the structural power of a steel fence. 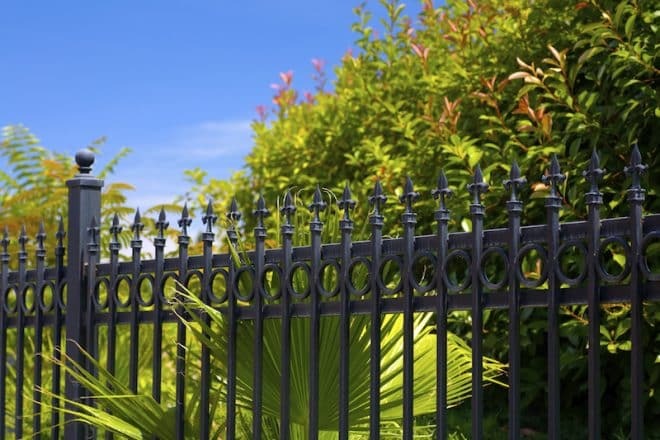 For all of the above reasons and more, steel fencing is an increasingly popular choice for Australian homes. Its modern, clean-cut look makes a strong impression on the surrounding community setting an exterior tone of pride in your house. If you’re sold on all these benefits, then give the fencing experts at Everlast a call today. We’d be more than happy to come around to your place and provide a free, no obligation quote.